About Soft Parade, Rolling Stone described two songs written by guitarist Robby Krieger, “Touch Me” and “Follow Me Down” as horn-string showpieces for the resonant baritone of Jim Morrison. Described as among the cleanest, most solid and, above all, most recognizable sounds in rock, the distinctive Doors’ sound was no doubt due to the Morrison power, but the other Doors were equally responsible. Ray Manzarek brought virtuosic keyboard tapestries, Krieger gritty, expressive fretwork, and Densmore dynamically rich percussion grooves. 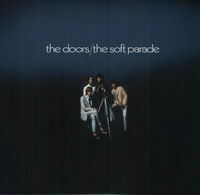 Half of the songs on Soft Parade, The Doors’ fourth LP, were written by Morrison and the other half by guitarist Krieger. “Touch Me” became one of The Doors’ most popular singles. Released as a single in December 1968, the song reached No. 3 on the Billboard Hot 100 and No. 1 in theCashbox Top 100 in early 1969. It was the band’s third American No. 1 single. Stereophile Record to Die For!